“Agroforestry” is a term not recognized by agricultural producers and decision makers in Poland. The extent of agroforestry in Poland is also not known. However, Trees outside Forests (ToF) are considered as important element of ecologic policy, including midfield trees. Despite this, there is no clear definition for ToF in the country. Shelterbelts systems in Wielkopolskie province and riparian buffers are well known in Poland. There are a number of different social actions aimed at planting trees on rural areas carried out by NGO (FER, Klub Gaja) or Landscape Parks (e.g. in Wielkopolskie province Landscape Parks Complex) and research studies related to trees on farming lands (e.g. Ryszkowski 2001; Orłowski and Nowak 2007; Zajączkowski and Zajączkowski 2009; Kędziora et al. 2012). Some initiatives are focused on planting old traditional varieties of fruit trees (e.g. projects of AgriNatura Foundation or Aeris Futuro Foundation), of which some are used for silvopastoral use. Slow development of extensive farming of beef cattle is observed, in some cases related to sustainable use of wooded grasslands, introduction of hedgerows or orchards grazing. We can find frequently sheep and goats grazed on wooded pastures. At last, initiatives with alley cropping systems appear (Juchowo Farm Foundation, North Poland). 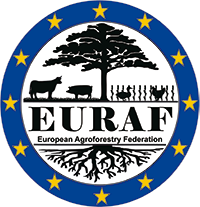 In 2018, EIP operational group on agroforestry has been launched. The group is focused on sustainable combined production of fruit shrubs and herbs. Polish Agroforestry Association has been established in 2015 and counts 30 members. Most of them are researchers, several are farmers. The association organizes annual meetings and workshops. Beef Cattle Farmers Association “Pastwisko” was established in 2018 and intends to promote and develop silvopastoral systems in Beskid Niski mountains. There are number of organizations, dealing with planting and management of trees on rural areas, but they do not consider themselves agroforestry organizations. Organic Agriculture Forum gathering organic farming experts supports policy of developing agroforestry in the country. The development and implementation of agroforestry systems in Poland is blocked at the level of legislative acts. There is no financial support for AF practices. The government did not implement Article 23 of the EU RD Regulation which supports the establishment and maintenance of AF areas. AF is not included as well in the measures for EFA within CAP Policy. Renewable energy support systems including bioenergy crops need significant changes. Overall, there is little knowledge about agroforestry among experts and practitioners. Physical conditions are difficult for farming in Poland: in the majority of farms with poor soil quality, low size and high fragmentation of farms/parcels. This restricts agroforestry to marginal areas, organic farms and large fields in more agroforestry-friendly farms.